I’m not sure I’ve mentioned it here before, but we’ve been a mostly vegetarian family for the past few years. 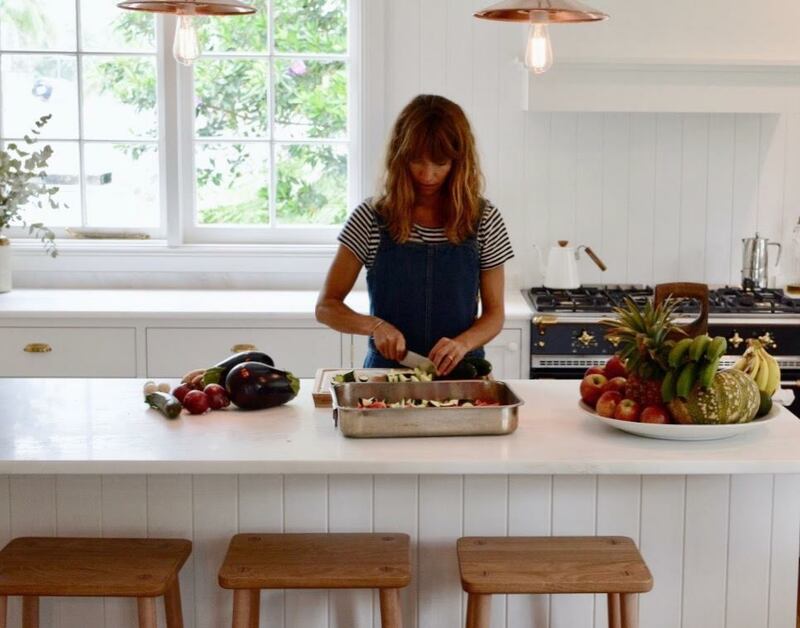 We’ll eat meat if it’s prepared for us, whether at a friends’ house or a barbecue where it’s the only option, but we don’t cook meat at home and haven’t ordered it in a restaurant since we left London a few years ago. 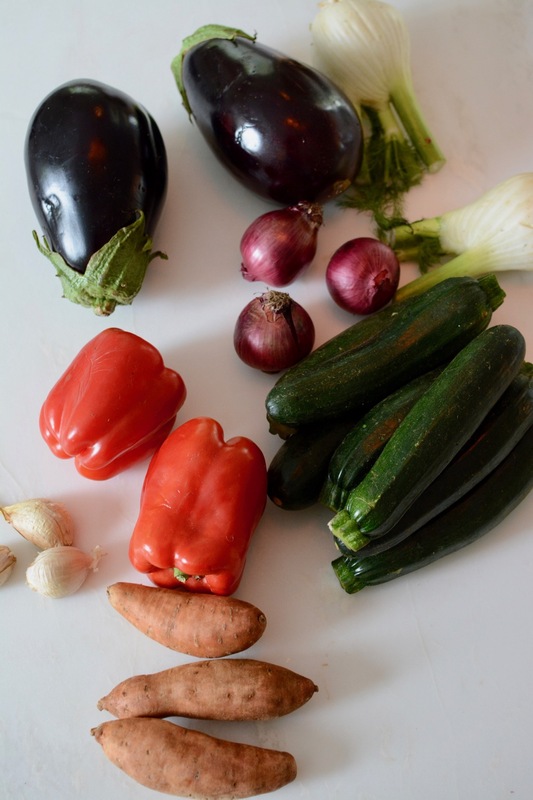 Our reasons for being vegetarian are mostly environmental, but we also really enjoy cooking and eating vegetarian foods. It has encouraged us to be more creative with our cooking and to come up with ways to get proteins into our meals. Over the past couple years we’ve been perfecting the vegetarian lasagne, and I think we finally have the most delicious unbeatable recipe. 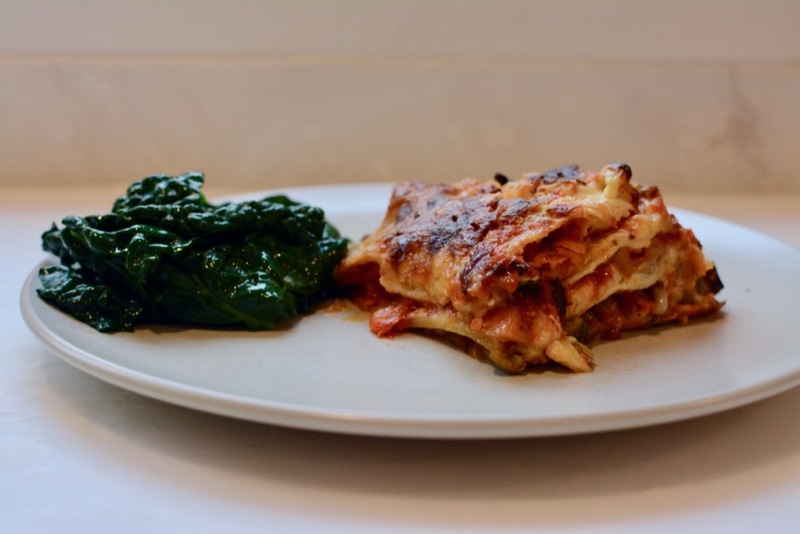 I’m such a fan of lasagne — it’s a warming, filling, delicious meal you can prepare in advance and serve easily. We have a large baking dish we use, which feeds 16 people easily, and it’s one of my favourite things to make if we’re planning a big dinner with friends. There are a few different steps to making lasagna, which can make it a bit time consuming. You’ve got to roast your vegetables, make a tomato sauce, make a béchamel sauce, and then layer it all together. But once it’s all finished, you’ve got your meal in a pan and you can relax come dinnertime. 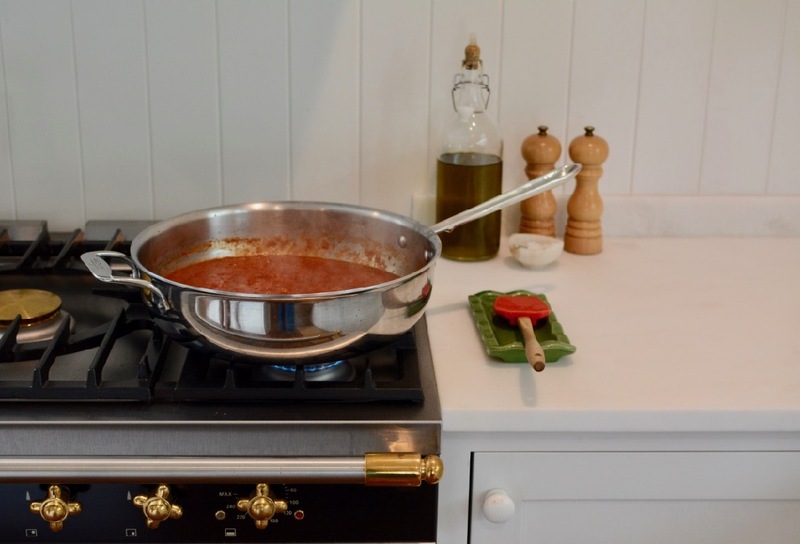 *Note: Our recipe makes a large lasagne, fitting into a 32 x 43 cm sized pan. You could divide this recipe in half and it would make a normal serving. Or… make two pans following the portions below and freeze one! 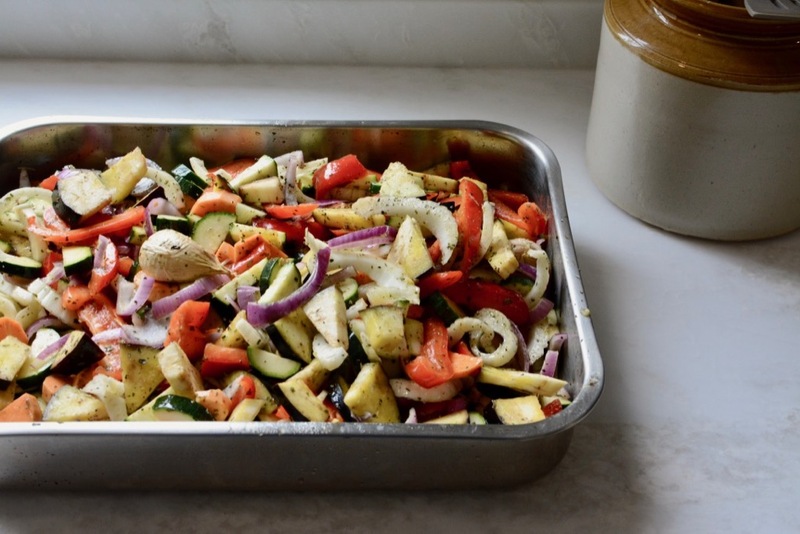 Slice up vegetables into large bite-sized pieces and combine in a large baking tray (I use the same tray to roast the vegetables as I do for the lasagna). Gently smash the garlic cloves and add to the pan whole and unpeeled. Drizzle with olive oil, salt and pepper and roast at 180°C for 30-40 minutes or until the vegetables are nice and roasted. Once you take the tray of veggies out of the oven, remove the garlic cloves and set aside (we add our roasted garlic to the béchamel sauce). Chop up garlic. Fill the bottom of a saucepan with olive oil and add garlic. Cook on low until garlic starts to brown. Add chopped tomotoes and cook on low heat for at least 30 minutes. Add fresh basil, stir and set aside. Melt butter in a saucepan over medium heat. Add flour. Cook, stirring, with a wooden spoon, for 1 to 2 minutes or until mixture bubbles. Gradually stir in the milk. Bring to the boil. Reduce heat to medium. Peel the roasted garlic cloves and smash them into the sauce and mix to combine. Cook, stirring, for 4 to 5 minutes or until mixture thickens. Add in cheese, stir to combine. Season with salt, pepper and nutmeg. We’ve read so many different ways to layer your lasagne, and in truth we’ve done it several different ways and the dish has never tasted too differently as a result. But here’s our favourite way: We put a very thin layer of tomato sauce spread across the bottom of the baking dish (which is still oily from the roasted veggies). We then put a layer of roasted vegetables. Then we layer the pasta sheets evenly over the veggies. Then we spread the béchamel sauce over the pasta layer and then sprinkle a layer of grated mozzarella over that. Then we start again: tomato sauce, vegetables, pasta sheets, béchamel, cheese. We then do a third and final layer. As an addition, we grate parmesan to the very top cheese layer. Then it’s ready to go in the oven! Bake the lasagne for roughly 40 minutes at 180°C. Serve and enjoy! I finally just made your Italian inspired tuna bean salad and it was delish! I added crushed red pepper on top and ate it with pita chips. Yum!! Looking forward to trying this Courtney, it sounds delicious. Would love to hear of more great vegetarian meals. This looks delicious! I’m so curious…what is a tin of tomatoes? 14.5 oz or 28oz can? Thanks!! Oh, thanks for the comment and question. I just mean a regular tin/can of tomoates. Here in Australia they measure it by grams and I just checked and it’s a 400g can! Thank you Courtney! We tried this recipe and our whole family loved it, it’s become a regular favourite in our home. We made it last night and loved it. Dropping some off to new parents today. Thanks! I made this for my family on Sunday and it tasted so good! I loved the bit about adding the roasted garlic to the white sauce, I’ve never thought of doing that before. Thank you for the recipe. Just made your delicious lasagne! The kids couldn’t wait for dinner tonight and ate some for lunch. We don’t make lasagne very often however when we do this will be the one we make from now on! Off to invite friends over for dinner to share this enormous meal! Thank you! I’m just popping in to say that I’ve made this lasagne about 8 times. I even planted my summer garden around this recipe and currently have an almost entirely homegrown tray of vegetables roasting in the oven. My whole family loves this version and I haven’t made a meat lasagne since! I also really love the large family recipe size. Thank you thank you!! !